Eight people are injured as a crane hit one of the world’s biggest cruise ships Oasis of the Seas in the Bahamas. 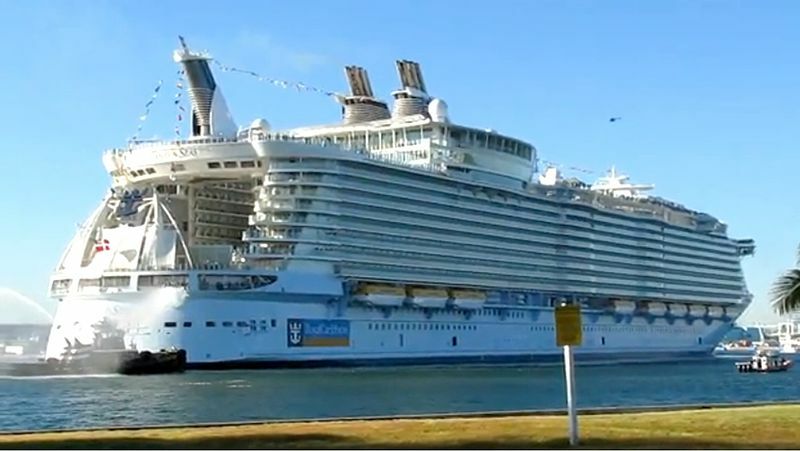 The huge Oasis of the Seas was hit by a construction crane in a dry dock near Freeport and eight dockyard workers were injured. The ship,which had been based at Port Canaveral, was undergoing routine maintenance on Grand Bahama Island, when the massive crane struck the ship, shipyard management reported. The accident happened on Monday at around 1.45pm local time. A construction crane came down and smashed into the stern of the fourth largest cruise ship in the world which has a capacity of 6,300 people. The crane smashed into the area its AquaTheatre is located causing the huge 228,225-tonne liner to list. Eight people were injured and none of the injuries were life-threatening, Royal Caribbean said in a statement. This entry was posted in Port Canaveral, Royal Caribbean International (RCI) and tagged Bahamas, cruise, drydock, Oasis of the Seas, ship by writer. Bookmark the permalink.